Oudemans told over 100 grape growers, wine makers and vineyard owners that careful monitoring of vines is critical to catching disease in early stages. “The strategies for these systemic diseases really are early detection, diagnosis – if you see something unusual in your vineyard early in the season, you can control it; if it’s later in the season and it’s spread to 50 or 80 plants, it’s much harder to control,” Oudemans said. Quoting an old farmer friend of his, Oudemans said, “The key to farming is to do the right thing at the right time.” He noted a new website has been created between researchers at Rutgers and Cornell universities that vineyard owners can visit. “The big five diseases are what haunt us every year and they’re not just limited to one vineyard” – they show up regularly all over Mid-Atlantic states, he noted. Common grapevine blights like powdery mildew, downy mildew and botrytis can be controlled by making good choices about what kind of chemistry you use to eliminate them, he said. He urged caution and careful diagnosis before deciding to spray for fungal afflictions. “In looking at these materials, they have a big range of targets, so you have to know your target. If you expect Endura to work against anthracnose or vermoxis, you’re going to be wrong, so as the chemists develop these molecules and develop them with greater specificity, we have to decide which ones are going to be the best for us,” Oudemans said. Efficacy, the effect of the chemical on your disease, can be broken down into separate components: spectrum of action, concentration, persistence, timing and distribution. “If you don’t pay attention to these things, it will not give you the level of efficacy that you’re used to,” he said. Whether the botrytis is affecting strawberries or grapes, he said, it’s critical to catch the disease in stage one, not stage two. He also noted loose clusters and aeration can help stem the flow of the disease. Oudemans noted effective disease management may end up being ineffective for many reasons, including unfavorable weather conditions. In New Jersey, “last year a very challenging year for controlling diseases – a lot of people experienced loss and weather is not something we have control over in the short term. Poor timing, that’s something we can fix. By paying attention, we can be doing the right thing at the right time,” he stated. In his experience with grapes, for an individual planting of a single variety, “they bloom over a very short period of time – usually within seven days you’re in and out of bloom,” Oudemans noted. So optimum timing for a spraying to control disease is critical. “You don’t have to be OCD about it, but when you see your first flower open, once you start to get petals, you can start to apply and you’re not going to be wasting it at that point,” he stressed. 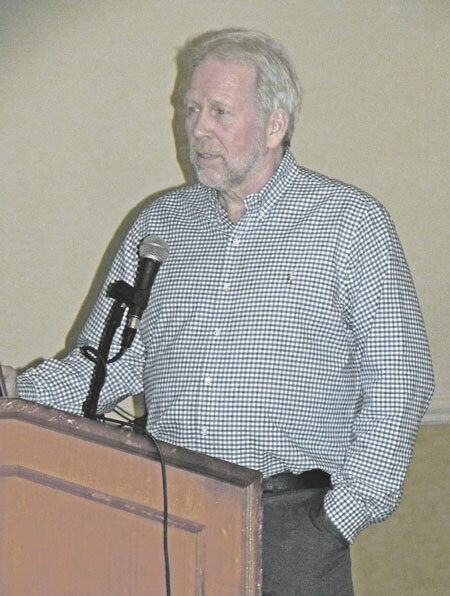 Paul Kurtz, an entomologist with the New Jersey Department of Agriculture, also addressed grape growers and wine makers at Grape Expectations. He explained the spotted lanternfly, an invasive species from China, is a pest that came to Pennsylvania in recent years and has since spread to several surrounding states. “We have a new pest impacting vineyards as well as anybody growing hops, fruit orchards and a whole lot of other industries,” Kurtz said, noting the spotted lanternfly (SLF) is a plant hopper, not a great flying insect. The fly does its damage through a large proboscis, sucking away on grapes, fruits and many other valuable crops. SLF can hitch a ride on a vehicle, wood pallets or any number of other products, “whether it’s a nymph, adult or even egg masses can be on articles going back and forth. SLF egg masses have a gray, waxy, mud-like appearance. They typically lay 30 to 50 eggs per mass. It’s just not your usual suspect as to how it’s moving across borders,” he said. In looking for evidence of SLF, Kurtz advised vineyard owners and farmers to look along the perimeters of fields, as the pest likes Tree of Heaven, black walnut and red maple trees as well as wild grapevines found on the edges of woods. Multiple egg masses can also found on trellis posts within a vineyard. Kurtz noted hops are the number one favorite host for SLF, but the pest is not picky. “In 2018, we had three growers [in New Jersey] who pretty much lost all their vines, so that’s a lot of money for those three vineyard owners. This spring, you should be focusing on the tree line or a break between hedgerows to see what you have. If you see something, you should contact us immediately,” he said. He also advised checking for SLF presence or infestation on a weekly basis, at least. With regard to chemical controls of SLFs, for nymphs, short residue products with good background will work, but for adults, vineyard owners will need to switch to a PHI compound. For post-harvest infestation, use long residual products like Bidrin, Kurtz said. In the affected counties in Pennsylvania, some farmers and vineyard owners are finding several types of wasps like to eat SLF eggs off trees and plants, so this same biocontrol may be introduced in other areas as well, depending on how severe the plague becomes. Farmers and vineyard owners in the Garden State who see infestations of spotted lanternflies – however minor – should email him at paul.kurtz@nj.ag.gov .